Document > New > Schematic , and play! Although EasyEDA saves all your files on our Server, sometimes you may want to save your work locally and EasyEDA provides a hack way to do this. You can right-click your project folder, and click “Download Project”, or export your design as EasyEDA source file via “Document > EasyEDA Source”. More detail you can view at Export EasyEDA Source section. Or you can download your project. After clicking on the history link, you will get a list of all of the Histories like in the image below. 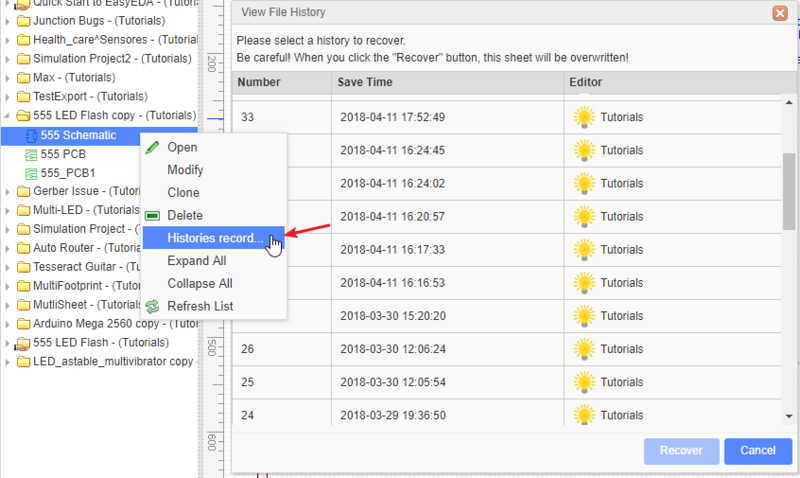 Click the History number, you can open the saved file in the editor, if this is what you need, you can save it to your project and delete your bad file. 1. For now all of the Histories are marked as number, we will allow you to add a tag soon. 2. Don’t save your files too frequently, or you will get lots of Histories and it will be hard to find the exact one you want. No operating system, software or network is perfect, so sometimes things can go wrong. Having your Desktop or web browser freeze or your broadband connection drop, two hours into laying out a PCB, could spoil your day. However, with EasyEDA, your day will be just fine. This is because EasyEDA auto saves and makes backups of all your open files to your computer so crash recovery is built into EasyEDA. 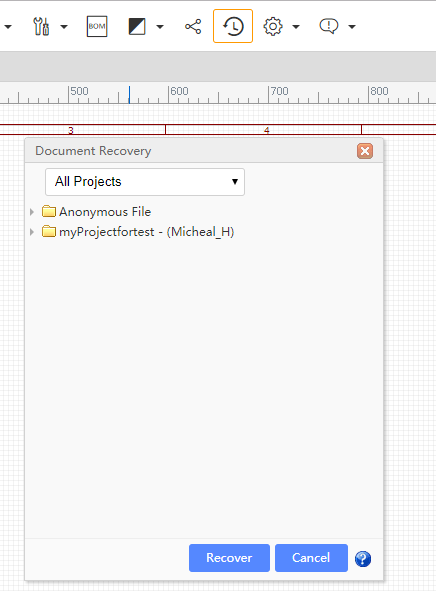 Select the file which you would like to recover, then click the Recover button; your file will be opened in a new tab. EasyEDA saves these crash recovery files on your computer and not on the EasyEDA server. Therefore you cannot recover files from a crash on one computer or browser by changing to a different computer or browser. And if you cleaned your browser’s cache, the recovery files will disappear. 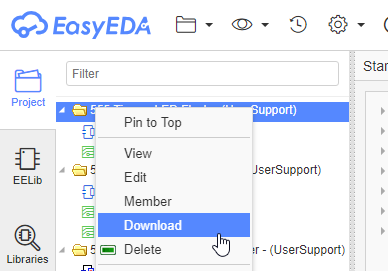 If you make a mistake to delete a file and remove the cache already, maybe you can find your document back via recycle bin: https://easyeda.com/account/user/recycles/personal. Hovering the mouse cursor over the areas indicated by the three green ellipses will bring up blue toolbar toggle lines. 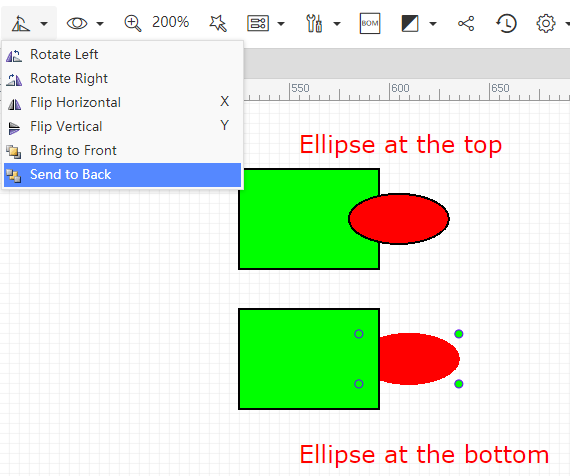 Clicking on them will toggle the visibility of their associated top, right and left toolbar areas to expand the canvas area. The vertical lines can also be dragged horizontally to resize the panels. Some users don’t like the cross cursor, so you can change it to arrow cursor like in the image below. Super Menu > Edit > Clear. Delete this schematic and create a new one. The exact left click functionality depends on what item is being selected and in what Canvas the item exists (Schematic or PCB). To get out of the current active context sensitive command such as placement or drawing mode and go back to select mode, just double right click. 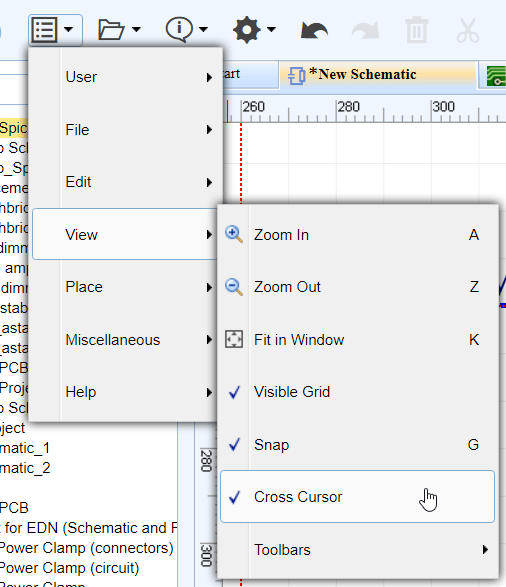 Ctrl+Right clicking anywhere in the Schematic, waveForm or PCB Canvas drags the canvas around within the EasyEDA window. Pressing the ESC key ends the current drawing action but does not exit the current active context sensitive command mode (i.e. it does not return the cursor to select mode). Using hotkeys, the default hotkey A for zoom in, Z for zoom out. Do not roll your mouse at the same time as pressing the CTRL key. Some browsers will zoom the whole site, not just the canvas in the EasyEDA window. If this happens, just press Ctrl+0 to reset the browser zoom. Double clicking any text area opens a resizable text box to allow you edit the text inline. Press enter to create new line. Click outside the text box to close it. Right click anywhere in the Schematic, WaveForm or PCB Canvas and Hold down right button to drags the canvas around within the EasyEDA window. If your canvas is bigger than the EasyEDA window and is showing scroll bars, you can use either the scroll bars or the Arrow keys to scroll the canvas to pan. When drawing a wire, a graphic line or shape that you wish to extend beyond the edge of the EasyEDA window holding down the left mouse button after starting the line will pan the canvas to keep the drawn item inside the window. If you use Chrome, and cursor is in the canvas while pressing CTRL or ALT key and rolling your mouse, the canvas will move vertically, and when pressing SHIFT and rolling your mouse, the canvas will move horizontally. or by pressing the default rotate hotkey: Space. 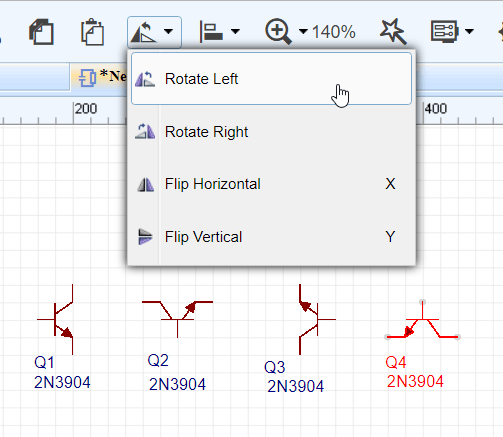 If in PCB, you can click the footprint and change it’s rotation at the right panel. Rotating a multiple selection rotates each item about its own symbol origin. It does not rotate the items about the centroid of the group of items. To place a Q2 as shown in the schematic below you need to Flip the item. or by pressing the default flip hotkeys: X to Flip Horizontal, Y to Flip Vertical. In the image below, both the rectangle and the ellipse are filled. 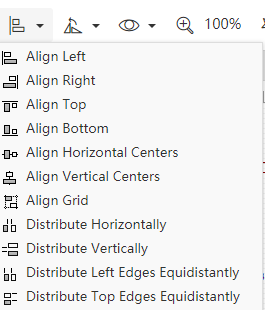 Align > Send to Back from the toolbar. It’s easy to fit your documents tab location.